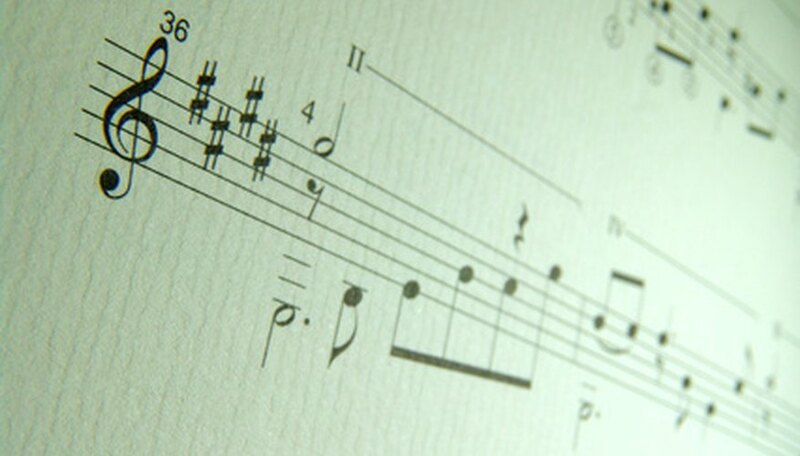 There are twelve notes in music. The natural notes are C-D-E-F-G-A-B. In addition to these notes, there are sharps or flats. The note a half tone above C is either C sharp or D flat, depending upon the key signature and context. Sharps and flats are indicated in a printed song's key signature. The number of sharps or flats can tell a skilled musician at a glance what notes are sharp or flat and what key the song should be played in. Learning to recognize sharps and flats is less difficult than it appears and can increase your musical skills. Remember that the key of C major contains no sharps or flats, the key of G contains only one sharp (F sharp) and the key of F has only one flat (B flat). These are the only key signatures that you need to memorize. Remaining sharps and flats can be found using a simple, consistent identification method. Memorize the order of sharps using a phrase. The order of sharps is F-C-G-D-A-E-B. A good phrase to remember this is Fat Cats Go Down Alleys Eating Baloney. Sharps will always appear in this order in a key signature. Identify the sharps in a key, as well as the name of the key signature, by locating the last sharp indicated and raising it a half step. If you have one sharp, it will always be F. Half a step up from F sharp is G, which is the name of the key signature for one sharp. If you have three sharps, they will always be F-C-G. Half a step up from the last sharp, G sharp, is A. That means the key of A has three sharps. They are always going to be F-C-G. Four sharps are F-C-G-D. Half a step up from D sharp is E, meaning the key of E has four sharps. Identify flats using a phrase to help remember the order of flats. A good phrase for memorizing flat order is BEAD Go Catch Fish. This means flats are always added in this order: B-E-A-D-G-C-F. If you have two flats, they will always be B flat and E flat. If you have four flats, they are always B-E-A-D. To find the name of the key signature, refer to the second to last flat in your series. Four flats (B-E-A-D) is the key of A flat because A flat is the second to last flat. Three flats (B-E-A) indicate the key of E flat because E is the second to last flat in the series. The order of flats is the same as the order of sharps, except in reverse.